Welcome to the Sprayberry High School Echo Project. 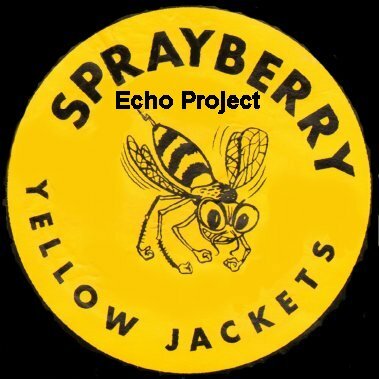 The goal of this website is to provide for you a visual record of every Echo annual published for the students of Sprayberry High School in Marietta, Georgia. Sprayberry opened its doors in 1952, and the first Echo was published in 1953. Obviously, this is a task that will never be complete as long as Sprayberry continues to operate as a school, as there will be a new annual every year. At present, the collection of annuals is almost complete into the late-1990's. Later editions will be added as they become available and are scanned. As you look through the scans on this site, please be aware that in almost every case the Echo scanned was a copy that belonged to someone, not a mint copy, so in some cases there will be writing on the pages. In most cases where writing was over white areas of a page, that writing has been painted out. In those cases where writing is over a picture, that writing has not been painted out so as to preserve the underlying image. However, in a few cases this writing may have been painted out to preserve the privacy of the album owner. While this site is free, nothing is totally free in this world. If you feel so moved, help in covering the costs of maintaining this site can be offered through either a small direct donation, or through the purchase of class year CDs. Please click on the "Support" or "Order" buttons above or to the left to help out. Thanks also goes to Debbie Hinderliter Fowler, Class of 1974, and Kyla Passman, teacher at Sprayberry, who helped me obtain many Echos that I was not able to borrow. A special thanks to Robin Are, who assisted me in the beginning with scanning and coding of many of the pages on this website, but grew weary of that, and now sits patiently waiting for hours while I work away in my office. I hope you enjoy your visit. Skip Are, Class of 1973. Finally, this website is dedicated to all the many students, faculty, administrators, staff, parents and supporters who made Sprayberry High School what it is today. No matter what year we attended, no matter which building we spent our years in, and no matter what divergent paths our lives have taken since we left, we are still brothers and sisters in the Sprayberry High School family. This website is always under construction, so some pages are not yet available, or do not yet have pictures on them. Your patience is appreciated. All text, logos, images, and photos not directly credited are © 2017 by Skip Are. Copyrights to credited photos are owned by the credited photographer. Web design by Skip Are.